Betfred may be more famous as a high street brand, but that has its benefits. You get high security and brilliant customer support. They’ve really shown that they can be just as successful online as they have been in the real world. Betfred CasinoPlay at Betfred Casino, get your €200 bonus now! Betfred began in 1967 when brothers Fred and Peter Done established their first betting shop in Salford. By the year 2000, they owned 200 stores across the UK, and in 2004 they expanded their business to the online market. Since then, Betfred has grown into one of the largest UK bookmakers, with over 1000 stores. The website is fairly well laid out, although you might say it’s a bit cluttered with all the offers screaming in your face. Can’t complain though, because they do have some fantastic offers. The games are very good, and use the Playtech platform. What this means is you get great quality in terms of visuals and ease of playing. Both the live and virtual games are very enjoyable to play. They’ve got a very large selection of games on offer, which should satisfy anyone who comes to Betfred Casino. And if you’re not sure, you can always try out the roulette games for free before you begin to spend your money. Read our roulette game reviews by clicking on the title of each game. Most common version of roulette, which uses a 37-number wheel with one zero. Real dealers spin real wheels, providing you with the most realistic roulette you can experience. Same rules as european roulette, but with a 38-number wheel and two zeros. 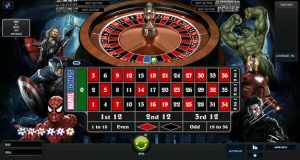 Similar to European Roulette, but with additional rules and betting options. Same rules as their non-premium/premier counterparts, but with greater customization intended to make the game more realistic. Same rules as their non-pro counterparts, but with additional game features. An additional betting option offers up to 99 times your stake each spin, and a multi-level Marvel Mystery Jackpot which could be activated at any time taking you through to a jackpot game, giving you the chance to win up to £1million! The same rules apply as european roulette, only now you get fantastic, cutting-edge 3D graphics. Uses a pinball machine rather than a roulette wheel, with a bonus round offering the chance to double or nothing. Overall I think Betfred have done an amazing job with their online casino. Their huge variety of games, each offering a fantastic playing experience, along with great security, customer support and the ability to play both virtual and live roulette on your mobile make Betfred Casino really stand out from the crowd.